Relationships are like living entities. They breathe, they grow and they also die. To prosper and to grow, every relationship needs nutrition in the form of open communication, love, respect, trust and commitment and great care and nurturing. There is one thing that works like a manure. A thing that is like oxygen to living beings and fertilizing manure to tender plants. The most important thing that makes any relationship work is the commitment – the willingness – to make it work. If the two partners are not willing to make the relationship survive, no matter how much respect they have for one another or how much trust they hold on each other, no relationship can sustain. It is this willingness that makes your partner do things that he won’t do otherwise, had he not been willing to make it work. 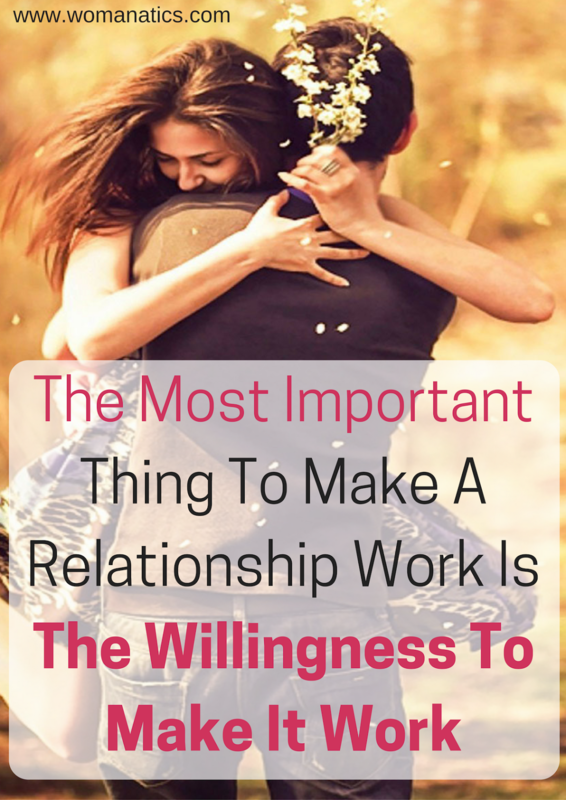 It is this willingness and commitment to make your relationship successful that you quit your job and decided to support your spouse and family while sacrificing your own personal and professional ambitions. This willingness is shown in the way a couple patches up immediately after a heated argument. These two people who have just had a heated argument let go of their individual egos and get up to say sorry because they want their relationship to thrive. Instead of feeding their egos, they feed their relationship through forgiveness. Many relationships die an early death because the partners gave up on each other too soon. Because one of them never wanted to be in it. It doesn’t matter if they were the right people for each other. What matters is whether the two people who have decided to be together actually make efforts to be together or not. We all enter long term commitment with the intent of making it long lasting. With the hopes that this relationship will survive forever. Still, 53% marriages in the USA end up in divorce. Why? It has to do with the willingness that I talked about in the beginning of this post. The wish to make your relationship successful includes being forgiving in nature. It means staying committed to your partner. It leads to taking care of your loved one. Many feel love is the basic ingredient of any happy marriage. While I agree love adds a fantastic flavor to the whole recipe, the overall taste and consistency comes from churning the right ingredients with the right pressure and at the right heat. Love changes with time. It grows. We all fall in and out of love many times. And with the same person. Trust works two ways. It has to be earned and it has to be placed from both the parties. Communication is much needed but sometimes some things are better left unsaid particularly when you are angry and furious at your partner. It is the commitment to the growth of the relationship that nurtures it the way a relationship should be taken care of. Both the partners should be committed to each other’s happiness and growth. They should be willing to let each other reach their highest potential as individuals. If such commitment is missing, if this willingness does not exist, if it next to impossible for any relationship to thrive and sustain beyond few years. I love reading your comments, your emails and messages. Let me know if you enjoyed reading this post. Share it, like it or comment on it. very well written Surabhi di.. simple facts and figures..loving it !! Nice post Surabhi..just yesterday I had an argument with my husband but since we both wanted the bitterness to end as soon as possible, we sat down and sorted things out in 30 minutes flat! Thankyou for liking the post and thanks for agreeing with me. You are right. Arguments take longer to resolve when people have ego on their minds and not the relationships. Wow Amazing post Surabhi… But not many people understand! I myself am going through the worst phase of my life… (Hence was out of touch) But I do realise it is important to live! Hey Vidhi.. ohh no.. what happened..? Can I help..? I am all ears if you want to share..! It is veryy important to live.. it is good to live 🙂 and problems come in life only when we get confused in our top priorities. I am very happy you liked the post. Hope it could help you in some way. when are you starting your blog? Well sort of stuck to get a good domain name! All the possible domain names are taken! Hey Vidhi.. Yeah.. part n parcel of life! It will all be good. Exactly…!! 🙂 there is no rainbow without sunshine and rain! Well Said Surabhi… Loved reading this post !! Thank you Sandhya. How have you been? Such a long time..
Im the good old days… when something stopped working in the house.. it was repaired… but now we unfortunately live in use and throw days.. if something aint working.. y bother fixing or repairing it.. jus get it replaced. . Same is with relationships. Today we dont want to fix it.. if its not working move on, let go is the new mantra. Today we r facing yolo crisis. We feel, we jus gonna live once so live it our way.its ok to call off relationships n break up… but little do we realise that its very easy to break something but it takes years of patience n efforts to make something. All relationships gp through its fair share of problems. Thats ok.. there is a saying in hindi.. takraar wahi hoti hah jaha pyaar hota hah… but after d takraar its pertinent that one makes up for it as well. . After all life is all about learning, loving and for giving. You have aptly summarized what I wanted to say Zeeya. I think it is important that we look beyond the imperfections.